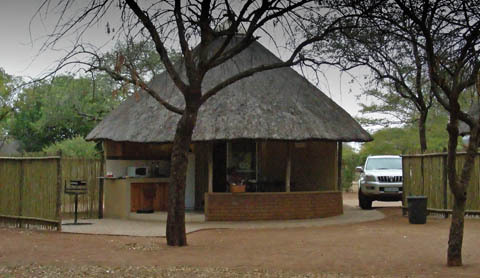 This camp is the only one in the Kruger that is not situated near a river or mountains / hills. It is the only 'plains camp'. The camp area is famous for its predator sightings and we have seen cheetah, lions and leopards here. The S100 is a very popular road and each morning many cars rush down this route to see if this is their lucky day! The camp bungalows are built in circles looking onto each other. The bungalows were not very private but in 2009 reed fences were erected between the bungalows allowing for more privacy. Have A Great Story About Your Stay at Satara? Do you have a great story to tell and photographs to show about your stay at Satara Camp? Please Share them! This hyena came galloping past our car on the dirt road behind Satara. It was most probably going to join its mates at a kill!